What kind of Printer Should I Use to Print W2 and 1099 Forms? You can print W2 and 1099 tax forms with the normal home/office laser and inkjet blank ink printer. No special printer is needed. 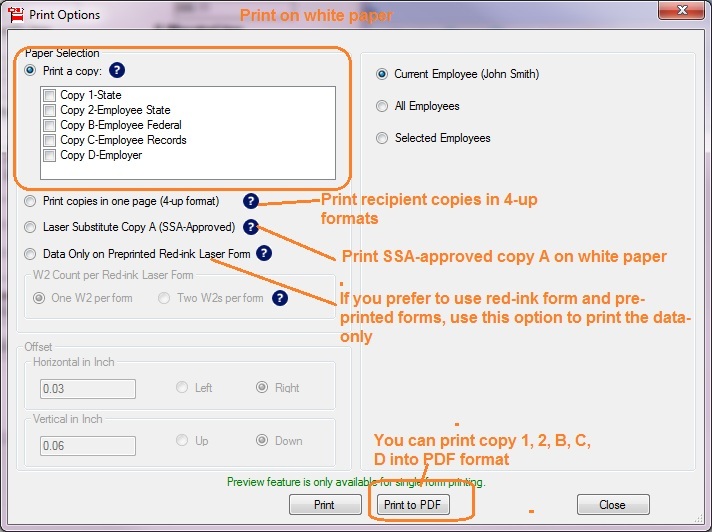 You can print W2 recipient copies on white paper. No red form is needed. However if you prefer the traditional red ink form, ezW2 can print data only on red ink form too. 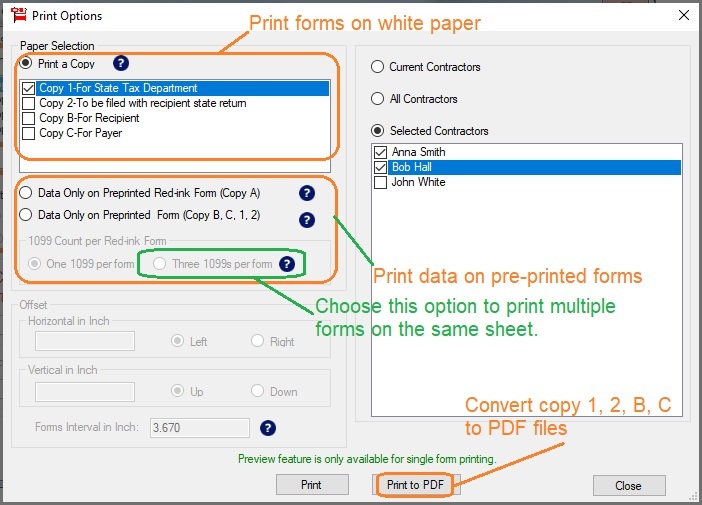 You can print 1099 recipient copies on white paper with ezW2 software or ez1099 software. You should print 1099 copy A and 1096 on red ink forms. IRS does not certify substitute black and white form right now. YOU CANNOT PRINT THE RED INK FORM YOURSELF! However, if you are a CPA and have many accounts, it will be easier to transfer the data manually. Here are the steps on how to copy the data from ezW2 2011 folder to ezW2 2012 folder. Start ezW2 2012, select this new database file as your current database file by clicking the top menu "Company Management->Select Company". ezW2 2012 comes with new BACKUP and RESTORE function. User can copy ezW2 2011 data to ezW2 2012 folder easily. Note: Do not forget step 4 to switch your current database file after you transfer data. Step 2. Start ezW2 2011, click the top menu “Company Management-> Backup current company". You can rename and save the database file to a folder or a flash disk. For example: you can rename the datbase file to “ABC Company 2012”. Step 3. Start ezW2 2012, click the top menu “Company Management-> Restore company". Then select the backup company database file. Step 4: Start ezW2 2012, select this new database file as your current database file by clicking the top menu "Company Management->Select Company". Step 5. You can edit your data there and print your new forms. <note:> If you have more than one companies, you need to change the current company in ezW2 and repeat the above steps. EzW2 software is the popular small-business software for compiling and printing forms W-2, W-3, 1099 and 1096. Users can print the forms on IRS-approved red-ink forms, if required, or on plain white paper using a standard laser printer. At just $39 per installation, ezW2 provides an affordable means of quickly compiling and printing these forms, saving them substantial time over completing forms by hand. ezW2 can print ALL W2 forms (W-2 copy A, B, C, D, 1 and 2) and W3 on plain white paper if user has a laser printer. EzW2 is compatible with Windows 7 system, 32-bit or 64-bit. It can run on Windows XP, Me, 2003 and Vista system too. 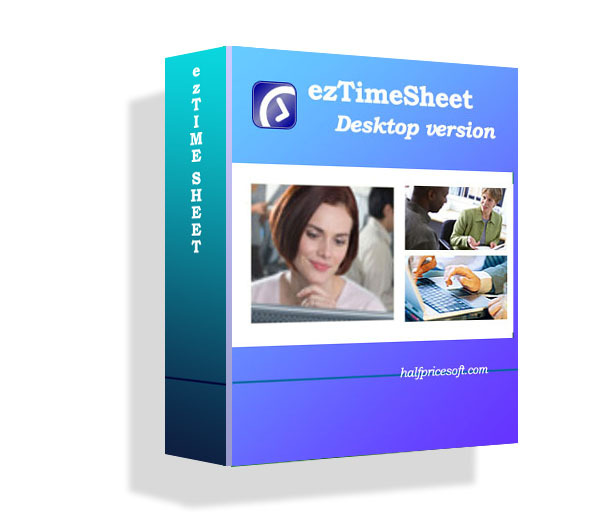 User can download the current version and the previous year’s version of ezW2 software from halfpricesoft.com. Followings are the 5 simple steps to re-print a lost form W-2. How to roll forward W2 and 1099 data? Yes, you can copy your 2010 databae file to your 2011 application folder. 1. Install ezW2 2011 first. 3. Backup database file to ezW2 2011 folder by clicking the top menu "Company Management->Backup current company". 4. 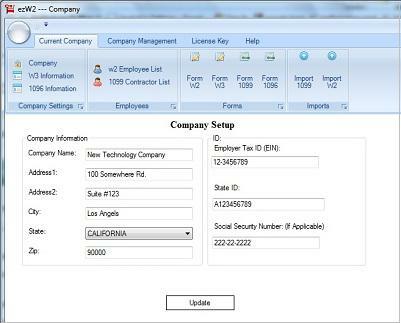 Start ezW2 2011, select this new database file as your current database file by clicking the top menu "Company Management->Select Company". 1. Change the Tax Year from 2010 to 2011. 2. Form W-3, Kind of Employer. To improve document matching compliance, box b of the 2011 Form W-3 has been expanded to include a new section, Kind of Employer, which contains five new checkboxes. Be sure to check the “None apply” checkbox if none of the other checkboxes apply. 3. Form W-3, boxes 9 and 12b are blank. 4. Form W-2, box 9 is blank. Payroll tax software provider, Halfpricesoft.com, reminds small business owners, HR managers and accountants that Jan 31, 2012 is the mailing deadline of 1099-MISC and W2 tax forms to recipients. Employers looking for ways to simplify W2 and 1099 tax preparation can try out the new improved ezW2 software from Halfpricesoft.com. ezW2 2011 has updated based on the new requirements. ezW2 2011 has been approved by SSA to print the Year 2011 laser substitute forms of W-2 Copy A and W-3 on white paper. If you file electronically, the due date is April 2, 2012. The clock is ticking. Small business owners looking for reliable software for filing W2, 1099 and related tax forms before Feb 28, 2011 mailing deadline can turn to ezW2 Software from Halfpricesoft.com. Thousands of users put their trust in ezW2 every year, knowing that Halfpricesoft.com provides unbeatable reliability and customer service. ezW2 software supports forms w2, w3, 1099 misc and 1096. It also save user money and time by printing the SSA approved laser substitute forms W2 copy A and W3 on the plain paper. ezW2 is compatible with Windows 7 system, 32-bit or 64-bit. It can run on Windows XP, Me, 2003 and Vista system too. ezW2 speeds up W-2 1099 filing and saves businesses money. 1) Social Security Administration-approved printing capability for printing substitute Form W2 on plain white paper - eliminating the need for expensive red-ink forms. So ezW2 can print ALL W2 forms (W-2 copy A, B, C, D, 1 and 2) and W3 on plain white paper if user has a laser printer. ezW2 can also print 1099 copy 1, 2, B and C on plain white paper. Since IRS does not certify laser substitute forms right now. ezW2 will fill data on red-ink forms of 1099 misc copy A and 1096. 2) ezW2 application also supports data only on pre-printed red-ink forms. Two W2 or 1099 red-forms printed per page, cutting paper consumption in half. 3) ezW2 supports quick W2 or 1099 data importing. 4) ezW2 supports unlimited accounts, employees and contractors with one flat rate. Available online at http://www.halfpricesoft.com/w2_software.asp for as little as $39 per installation, ezW2 is engineered for the business owner who doesn’t have a background in accounting or computers. The interface is intuitive, user friendly and designed to get customers up and running without the huge learning curve and expense often associated with business software. How to convert form 1099's and W2's into PDF format files? How to convert W2 1099 forms into PDF format files? How to convert 1099 forms into PDF format files? 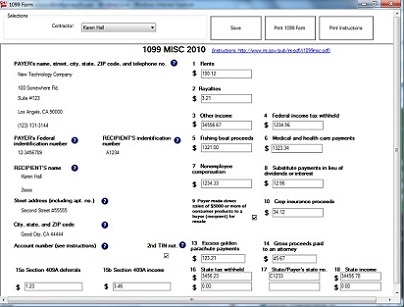 Step 2: Click the top menu “Current Company->Form 1099” to open 1099 Edit forms. Step 3: Enter 1099 information then click the button Print 1099 Form to open print option screen. Step 4: If you want to generate the PDF format files, you can check the options and click the button “Print to PDF”. - You can generate the PDF file for one recipient or multiple recipients. - You can specify the file path after you click the “Print to PDF” button. - The forms for one recipient will be saved into one file with file name like firstname_lastname1099.pdf, which you can email to your recipient later. - ezW2 can generate the PDF file for Form 1099-misc copy 1, 2, B and C.
How to convert W-2 forms into PDF format files? 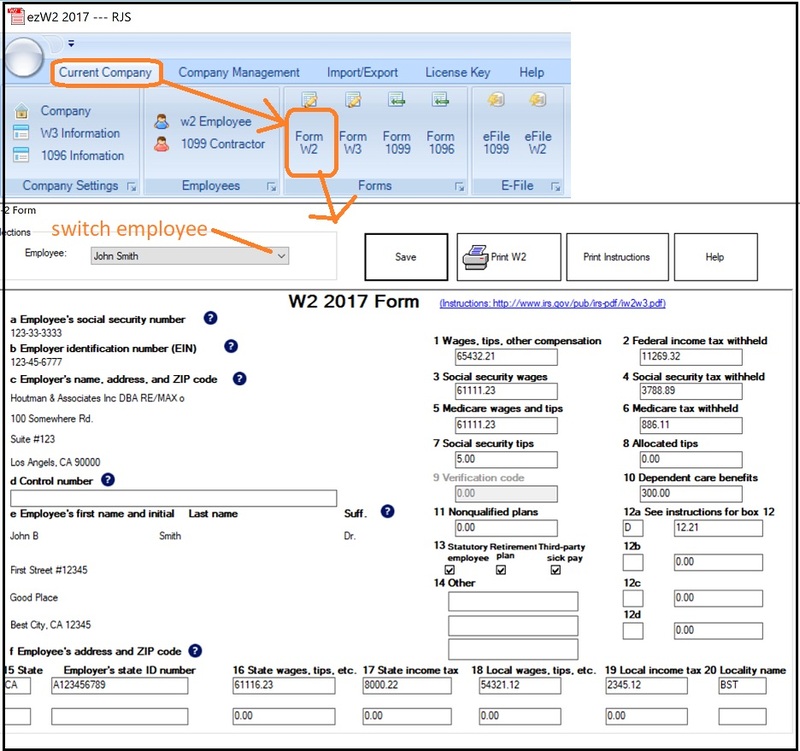 Step 2: Click the top menu “Current Company->Form W-2” to open W-2 Edit forms. Step 3: Enter W2 information then click the button Print W2 Form to open print option screen. - ezW2 can generate the PDF file for Form W-2 copy 1, 2, B, C and D.